Tal: You guys were pretty good but you were one arm short of a Def Leppard cover band. On one particular night in New York City, an elusive band by the name of Where’s Fluffy? have announced a secret concert. The word spreads through the city’s underground punk scene faster than it can go out of style and before long, it reaches Nick and Norah. Nick and Norah don’t know each other when this news reaches their ears but before the end of the night, they will each find something infinitely more important than Fluffy. 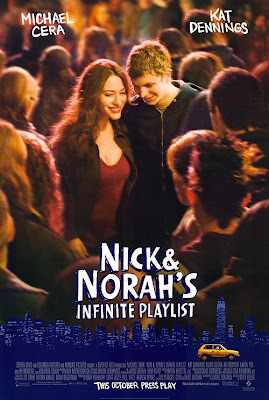 NICK AND NORAH’S INFINITE PLAYLIST is a contemporary romantic comedy that sets itself in an entirely unconventional place and time (can you think of another way to describe a straight romance in the queer punk underground? ), but presents itself in a sometimes far too conventional fashion. While it can at times be too cool for school, it is the roughness around its edges that give it an unexpected and genuine warmth. Like any finely balanced playlist, it works its way into your head and your soul. Nick (Michael Cera) has been down as of late. It seems his fragile heart has been trampled by Tris (Alexis Dziena), a girl so clearly wrong for him but whose physical beauty is apparently capable of diverting people from noticing her lack of a soul. 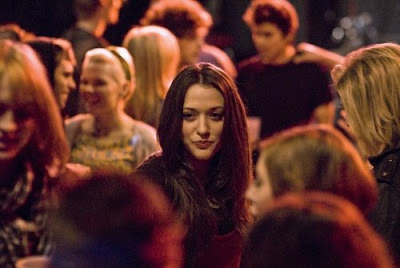 Norah (Kat Dennings) has some trust issues as she naturally assumes that any man interested in her is likely more interested in her connections (her dad is an enormously successful record executive). As a result, both Nick and Norah have withdrawn – not externally as they both still function amongst the other humans but they do so at arm’s length. Like sleeping beauties though, they are both awoken from their waking comas by a shared impromptu kiss. Suddenly, worlds they never knew existed have become possibilities and an ordinary evening becomes an adventure. While the twists the evening takes are at times unrealistic, they do give the night and the film a sense of spontaneity that makes the viewer believe that anything can happen. Peter Sollett is a delicate director. His first feature, RAISING VICTOR VARGAS, in which a group of Hispanic youths in New York’s lower east side figure out how to stop playing and how to be themselves instead, was a singular revelation. He created a strong sense of hesitation in face of the unknown and a desire to be something more. He has an ease with creating simple, real spaces that foster intimacy and humble his characters and Nick and Norah are no exception to his treatment. Outside of these two though, the remaining ensemble are little more than comic relief and functional plot progression pieces. They can come across as occasionally transparent and one-dimensional but thankfully never enough to distract from the delightful romance budding at the center of all the chaos. Cera proves his versatility once again by showing that there are hundreds of facets to being an awkward teenager, that awkwardness does not define you but is rather just how who you are can come across. Dennings is his perfect counterpoint; she is sharp and strong, a worthy adversary, but frightened underneath it all, an ideal match. The two are so strongly suited that they transform the sometimes too facile script into something much more mature and meaningful. 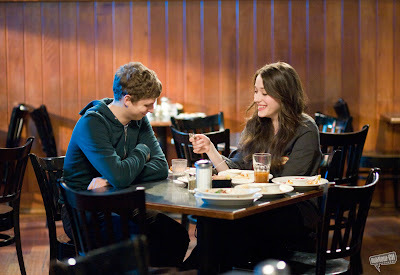 NICK AND NORAH’S INFINITE PLAYLIST made me want to fall in love. It also made me laugh and swoon, delight in the magic of music and believe in the transformative properties of one crazy night. It made me long to be in New York City. It made me wish that I was that young again and that believing in possibilities was that easy to do. It may not be perfect but it is almost better that way, more real. 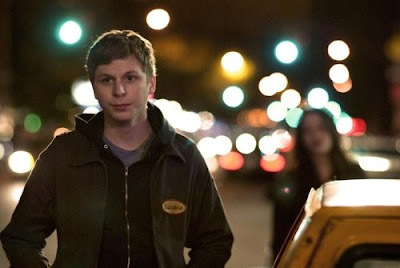 There is something so genuine at the heart of this film that makes it almost impossible not to want for Nick and Norah to realize their potential – a potential that is just as infinite as the playlist they are about to create together. Ugh. No kidding. This movie makes me want to fall in love like that. Or at least experience a night like that. Just one! And the soundtrack was excellent! Definitely infinite. Hey man – this just opened over here in the UK… Have reviewed it over at Darkmatters (wanna swap links?) and saw your review linked from IMDB – seems we are of like minds on it!